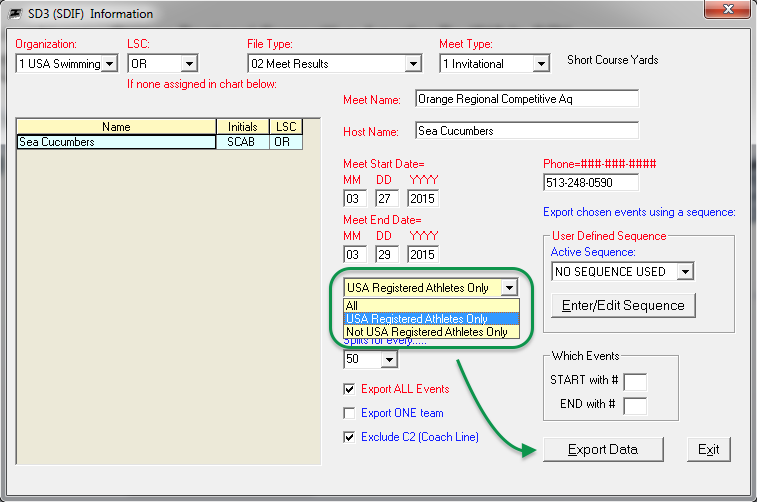 After hosting an approved or observed USA Swimming meet, here is how to export a results file and select whether to include times for Registered USA Swimming athletes only, Not Registered USA Swimming athletes or both. When you sync results for a sanctioned meet, it will only include results for USA Registered athletes. This process below allows you to include unsanctioned athletes as well in a separate set of meet results. If you selected All or Not USA Registered Athletes Only, it will ask "Do you wish to include the 'Not USA Registered' #'s in the SD3 file?" Admins using unsanctioned athletes from SwimOffice can click Yes to create a file that includes Not USA Registered athletes' results with their existing swimmer IDs and manually import it into SwimOffice. This is useful for teams who want meet results with registered and not registered USA Swimmers for their times databases. Those teams utilizing Team Manager should click No unless they really want results included for Not USA Registered athletes.